From luxe metallic accents to more classic styles and patterns, we've rounded up the best in Fine Dinnerware. Get inspired by these table designs for your registry! 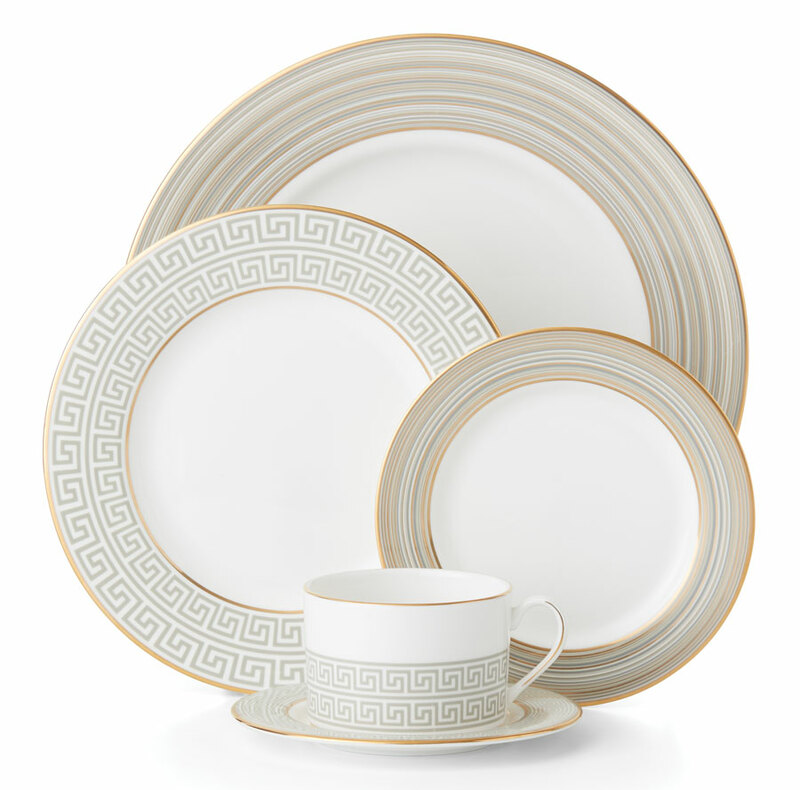 A modern expression of iconic design, Delphi bone china features a classic Greek key design layered with a delicate striping of warm neutrals paired with glistening gold. Available in a combination of rim and coupe shapes. Made in the U.S.A and dishwasher safe. A Bloomingdale’s exclusive. A free-spirited bohemian collection designed with layering mosaic motifs, artisanal details, updated coupe shapes, and touches of innovative microwave safe gold. Each piece brings a unique element to the home with giftware and serveware in ceramic, glass, metal, and wood materials to create an authentic lifestyle collection. Porcelain dinnerware is dishwasher and microwave safe. A Bloomingdale’s exclusive, this dinnerware features a white porcelain body that catches your eye with a striking decoration of blue tones and a shiny gold band on each piece. Microwave and dishwasher safe. A broad band of platinum borders each piece in white porcelain. This accent features a softly frosted background etched with geometric borders and interwoven flourishes. Also available in gold and in platinum with a cobalt inner band. Traditional gold banding paired with a super modern blurred edge on fine bone china. With a name derived from a Japanese proverb, Haku is designed to add joy to your meals. Available at Bed Bath & Beyond. Odessa Platinum features a wide, etched platinum band, coupled with an inner band of delicate white florals over a whisper of dove gray. Also available with a gold band, or with a bold cobalt blue band. A more relaxed approach to formal dinnerware. Keeping to a simple modern feeling, this pattern interprets a classic scroll motif in an updated and playful manner. Also available in gold, chocolate, cobalt blue, and ebony. Elegant meandering olive leaves now in a crisp new blue color lend a contemporary feel to this timeless pattern. Microwave and dishwasher safe. Visit biacordonbleu.bridgecatalog.com for more information.